A Michigan family had been using the 22-pound rock as a doorstop for the last 30 years when it occurred to them to bring it to the local university for analysis. Central Michigan UniversityThe 22-pound meteorite is part nickel, part iron. 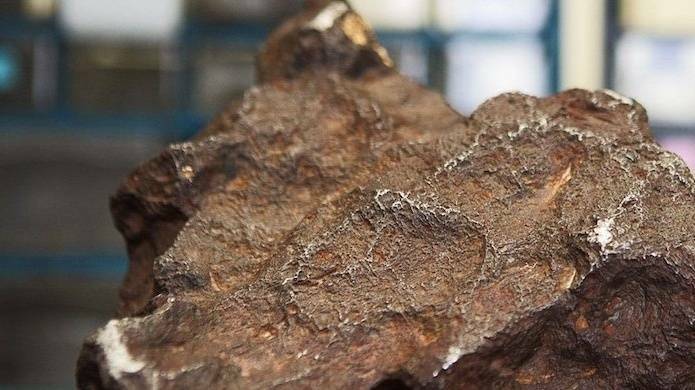 A 22-pound rock that has been holding open doors for the last 30 years at Central Michigan University has just been discovered to actually be a meteorite. And it’s valued at $100K. Earlier this year an anonymous Michigan man brought the rock to Mona Sirbescu, a CMU geology professor who fields plenty of false alarms with regards to “space rocks” brought to her lab. “For 18 years, the answer has been categorically ‘no’ — meteor wrongs, not meteorites,” Sibescu said in a statement. Not this time, though: “I could tell right away that this was something special,” Sibescu continued. Indeed, the meteorite is the sixth largest found in the state of Michigan and could fetch up to $100,000. The anonymous man was touring the property of a farm he had purchased in Edmore, Mich. when he spotted the rock propping open a door in the shed. When he asked the owner about it, the owner simply said that it was a meteorite which had fallen to the farm back in the 30s. “It made a heck of a noise when it hit,” he is recalled to have said. The rock reportedly left a small crater and was still warm when the farm owner and his father dug it out those many years ago. The owner told the man buying his farm that the meteorite was part of the property and was therefore his now. Closeup of the world’s most expensive doorstop. The meteorite became a fixture in the man’s home and he brought it with him when he eventually moved out of the farm decades ago. The rock went with his children to school for show-and-tell and continued to prop open doors for the last 30 years until it dawned on him that other Michigan residents had been taking their strange space-related materials to be appraised. 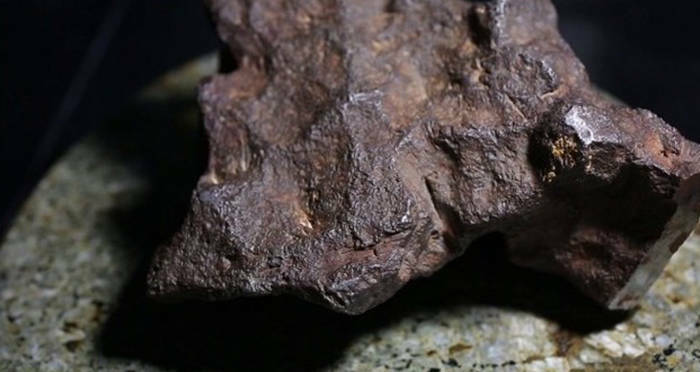 The meteorite was examined to be 88.5 percent iron and 11.5 percent nickel. It was also sent for verification to the Smithsonian in Washington, D.C, which is, along with a mineral museum in Maine, considering buying the specimen. The anonymous man has agreed to give 10 percent of whatever the sale turns out to be to the University. All involved have agreed to name the find the Edmore Meteorite. “Just think, what I was holding is a piece of the early solar system that literally fell into our hands,” Sibescu gushed. This is not the first time a particularly heavy rock was revealed to be an ancient piece of the solar system – and used as a doorstop no less. In 2012, a Tennessee couple brought their 33-pound, green-painted doorstop to Arizona State University only to realize they had been keeping a four-billion-year-old meteorite in their home for the last 30 years. Imagine the price tag on that rock. Until a sale for the Edmore Meteorite goes through, a sample remains with the Smithsonian, and further research is being done to determine which asteroid the meteorite originated from. Until then, Michigan residents will likely be keeping their heads to the ground for more potential finds. After learning about this very expensive doorstop, read about the meteor that turned out to actually be frozen feces and the discovery of a thousand year old treasure of a Danish king by a 13 year old boy.